The ISOFIT comfortable sleeve provides stretchable, breathable and comfortable coverage. Many runners appreciated the diverse color options for the Zealot ISO as it broadens the appeal. The moderately light weight of this shoe was welcomed by reviewers. The PWRGRID+ underfoot platform offers 20% more cushioning that’s durable and responsive. A support frame holds the heel in place while giving it structure, noted a handful of runners. Durable rubber is found on the outsole and it gives effective traction for the wearer. For some of the testers, the upper got easily torn after a few uses. Some criticized the rear section of the upper because it was too tight for them. The Zealot ISO has an expensive price tag. 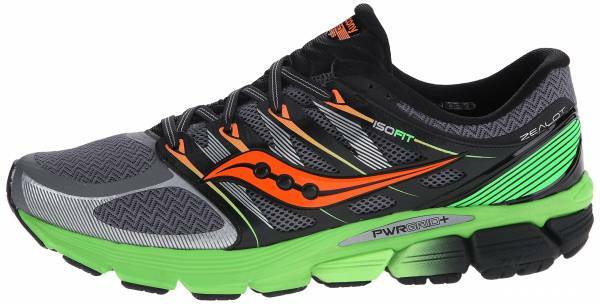 The Saucony Zealot ISO is a popular running shoe that many runners have come to enjoy. It looks great and it functions well, making it a superb choice for daily exercises and training. Given all the positive praises, the shoe is indeed considered by wearers as a dependable running shoe. The Saucony Zealot is an all-around very solid shoe. The technologies that reside in this shoe, including the ISOFIT system and PWRGRID+ are really very sound advancements. I expect long term outsole wear to be outstanding. The ISOFIT upper is a comfort and fitting innovation. I have to start this review off by saying that the Zealot is a fantastic looking shoe, and the Viziglo orange colorway that Saucony sent me is bright. Very bright! It wasn’t quite agile enough for faster turnover sessions on the track. The midsole of the Saucony Zealot ISO feature the new and enhanced PWRGRID+ platform that delivers 20% more cushioning than the regular midsole for a more resilient ride. This enhanced platform is also more durable and reliable. The shoe also uses the updated ISOFIT technology the delivers an impressive fit and comfort to runners. It is highly stretchable and flex naturally together with the foot’s natural movement. This element gives a sock-like and ultra-soft feel. The Zealot ISO is available in true to size measurements. The heel, midfoot and forefoot are of standard measurements. Those runners with regular foot shape and size will experience a great fit on this shoe.. The Zealot ISO is available in standard widths of D for the men’s and B for the women’s. The XT-900 technology was extended all throughout the outsole to deliver durable traction on the road. The forefoot area also uses the IBR+ technology, a flexible and lightweight material that offers added cushioning and responsive ride. The IBR+ and the XT-900 are outsole materials that are also utilized in the Saucony Zealot ISO 3. The shoe uses the Saucony’s PWRGRID+ technology that offers added cushioning for underfoot protection. This is also engineered to deliver impressive shock absorption and efficient energy-return for a more resilient running experience. With the SRC Impact Zone, a smoother heel-to-toe transition is not impossible. The upper of the Saucony Zealot ISO features the stretchable ISOFIT mesh that delivers impressive fit by following the foot’s movement and shape. This perfectly matches with the shoe’s open toe box design that delivers a seamless construction, enhancing sock-like feel and comfort. The brand’s RUNDRY collar lining secures the heel while maintaining its moisture-wicking attributes.